Have recorded some 4K footage on the Mavic Pro and decide to import them into Final Cut Pro, the following article will show you how to get the smooth workflow of DJI Mavic Pro 4K with Final Cut Pro 7 or Final Cut Pro X on powerful or slow Mac computer. The main reason is that H.264 is a good delivery file format, but not an ideal editing format, it has the following drawbacks when editing natively with Final Cut Pro X. 1. H.264 is mathematically intense. It takes some serious computer horsepower to decode its compression. 2. Because it is so mathematically challenging, it takes longer to render H.264 files than other formats. 3. As H.264 is an 8-bit format shot by HDSLR, which means you are potentially compromising your effects and especially color correction and composing gradients. 4. H.264 does not integrate easily with other video formats. If you wish to get a fast and smooth workflow of DJI Mavic Pro 4K H.264 with FCP X on powerful Mac computer, it would be much ideal for you to encode H.264 to Apple Prores codec, which much much file size than H.264, but it has the following benefits when work with FCP X. 1.Prores is less hardware intensive than H.264, you don’t need a fancy graphics card and you don’t need as fast a computer to edit these transcoded formats. 2. The Prores is a 16-bit container, which can significantly improve the quality of your rendered effects. Here, you can easily transcode DJI Mavic Pro 4K H.264 to Apple Prores with Pavtube HD Video Converter for Mac. 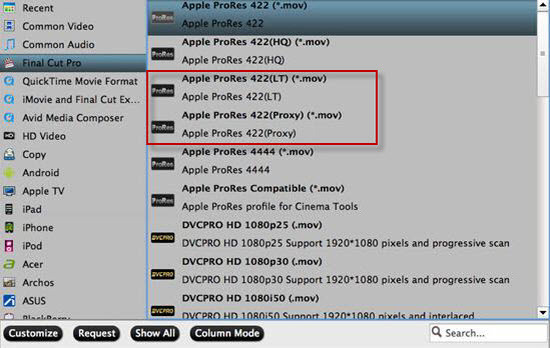 The program can produce Apple Prores in various different file types including Apple Prores 422, Apple Prores 422 HQ, Apple Prores 422 Proxy and Apple Prores 422 LT. If you Mac computer are powerful enough to handle multicam and high-resolution video and you are going to do many effects editing work with FCP X, you’d better choose to output “Apple Prores 422(*.mov)”or “Apple Prores 422(HQ)(*.mov)” for better performance. However, if your Mac computer is old or slow, or you just want to do some rough editing, you can select to output “Apple Prores Proxy)(*.mov)”or “Apple Prores (LT)(*.mov)” format to save more space and bandwidth. The program is pretty simple to use, any one can learn to use it in minutes. In addition, it keeps constant update with perfect support for the new Mac OS X El Capitan and macOS Sierra 10.12. In addition, the results produced by the program are pretty high quality, you can’t tell the difference between the converted video and the original 4K video. How to Convert Mavic Pro 4K H.264 to Apple Prores for FCP X Best Editing Workflow? Step 1: Transfer DJI Mavic Pro 4K video to Mac computer. The DJI Mavic Pro 4K records footage on an SD card, you can remove the SD card from the camera, insert the SD card to a card reader, then plug in the card reader into your Mac computer SD card Port for transferring the video footage to your Mac local hard drive. Step 2: Import DJI Mavic Pro 4K videos. From “File”drop-down option, select “add Video/Audio”to add source DJI Mavic Pro 4K video files to the program. Step 3: Select output file format. From “Format”bar drop-down list, select your desired Prores format types according to your own needs. If your Mac computer is powerful enough to handle 4K video, it would be ideal for you to choose “Apple Prores 422(*.mov)” or “”Apple Prores 422(HQ)(*.mov)”for high quality performance on FCP X. If you have a slow Mac computer, it is ideal for you to output “Apple Prores 422(Proxy)(*.mov)” or “Apple Prores 422(LT)(*.mov)” format. After all the settings is over, go back to the main interface and hit right-bottom “Convert” button to start to convert Mavic Pro 4K H.264 video to FCP X best favorable editing format Apple Prores codec. When the conversion is completed, launch Final Cut Pro on your Mac computer to import converted video to FCP for smooth editing workflow on either powerful or slow Mac computer. There are multiple ways to create Proxy media in Final Cut Pro X: You can do so upon initial media import, or you can do so after media is imported. On the media import screen, you’ll see an option under the Transcoding section to create proxy media. Ensure that this option is checked to convert all imported videos to proxy media right after import. The second way to create proxy media can be employed after media is imported. Simply right-click on the media that you wish to convert to proxy media, select Transcode Media and check the box next to Create proxy media and click OK. You can also create proxy media via the Info tab in the Inspector.